What a great way to start my day! There’s nothing more lovely than hearing the words “thank you” in response to something you’ve done. As a parent, hearing those words from my children is extra special. As I relished the moment of gratitude expressed by one daughter, I began to think about just how much gratitude I show my Abba Father. 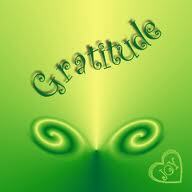 How many times do I pause long enough to reflect on the too-many-to-count blessings in my life, and say “thank you”? I’m not a person who tends to grumble. I try to always approach situations with a positive outlook. I even reflect on how blessed my life is. But I’m also not very good about expressing that gratitude – be it to my children, my husband, my friends, or even my God. Being on the receiving end of that gratitude this morning, I was reminded about the importance of expressing my own thankfulness to others. This week I choose to not only be grateful, but to also openly and extravagantly express that gratitude. My prayers this week will focus on thanking the Lord for who He is and what He has done, rather than what I want to receive and what I need. I enjoy reading a post that makes people think. Some as a matter of fact perfect posts on this internet site , thanks for contribution. Also, thanks for allowing me to comment!